Join the discussion on our forums! 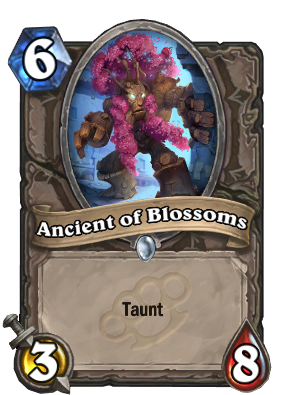 Come discuss Ancient of Blossoms over in our dedicated Ancient of Blossoms discussion topic. He looks like your sister entering the room to ask you for something and catches you masturbating to something weird. Why would you pick this card?? When you can get 1 turn later a 6/8 (bog creeper)??? 3 more attack dmg for 1 more mana. 4/7 taunt for 6 would be much better. Why is it a neutral? aren't giant old walking trees a druid thing? Its ok in arena .. why are people hating on this card ? soo, this has -2 stats just for taunt? seems pretty weak..
Yeah, it's inline with Fen Creeper. Worst card ever? Like who would play this, even in a meme deck? I mean, this thing is probably going to get as much attention as any other filler card, but it has potential in Taunt Warrior and in Arena. Besides, remember when everyone was saying Bog Creeper was trash and it ended up seeing a lot of play in Control Shaman and sometimes Ressurect Priest? If Bog Creeper can see play I don't see why this card can't. This card might be weak against priest for a 6 drop. not a bad choice for taunt warrior though. The Ancients of Bubbles and Buttercups are apparently on their way soon, they just got caught up in some crimefighting.